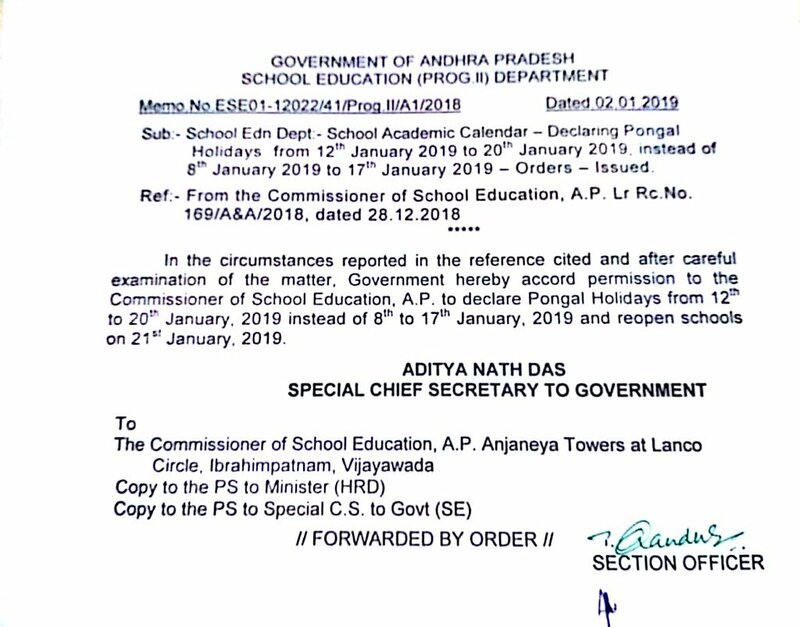 AP Sankranthi Holidays, AP Pongal Festival holidays 2019 for AP Schools, AP Pongal holidays 2019, 2nd Term Holidays to AP Schools for 2018-2019: CSE, AP has announced the Pongal(Snakranthi) Festival holidays to the AP govt/aided/private schools from 12-01-2019 to 20-01-2019. Subject - School Edn Dept - School Academic Calendar - Declaring Pongal Holidays from 12th January 2019 to 20th January 2019 instead of 8th January 2019 to 17th January 2019 - Orders - Issued. In the circumstances reported in the reference cited and after careful examination of the matter, Government hereby accord permission to the Commissioner of School Education, A.P. to declare Pongal Holidays from 12th to 20th. January. 2019 instead of 8th to 17th January, 2019 and reopen schools on 21st January. 2019. CSE, AP: Subject: School Education -Academic Calendar for the year 2018-2019 - Pongal Holidays from 12-01-2019 to 20-01-2019, Reference: School Academic Calendar 2018-2019. The attention of all the Regional Joint Directors of School Education and the District Educational Officers in the State is invited to the reference read wherein the Pongal Holidays have been declared from 12-01-2019 to 20-01-2019 and the schools should reopen on 21.01.2019. They are requested to take action accordingly. Treat this reference as Most Urgent, This has the approval of Commissioner of School Education, A.P., Hyderabad.